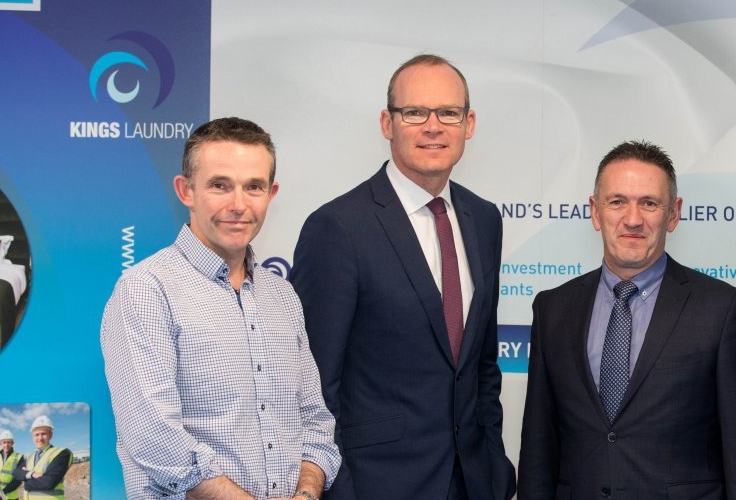 Pictured at the 2017 announcement of a new facility in Cork are Robert Mcgovern (left), Managing Director, and Alan Murphy (right), Sales Director from Kings Laundry with the then Minister for Housing, Planning and Local Government, Simon Coveney. Crowe Ireland is pleased to have assisted in the successful sale of Kings Laundry Limited to French multinational Elis plc – a European leader in laundry and hygiene services. Kings Laundry’s Managing Director Robert McGovern has had a long association with the firm and in particular with Audit Partner Brian Geraghty, who has acted for the company throughout its transition from a laundry shop in Dún Laoghaire to a nationwide leader in the supply of linen to the hospitality and healthcare sector. Robert will remain on after the sale to head up Elis’s operations in Ireland. Emma Shortt and Daithi DeBarra, two senior members of the Crowe team worked closely with Kings and the solicitors acting in the case, Peter Walsh and Claire Morgan of Orpen Franks, to manage the process, including negotiating the contracts, disclosures and due diligence. Tax Partner Grayson Buckley advised on the taxation aspects. While the deal is subject to regulatory approval, the clients Robert and Patricia McGovern and Alan Murphy, are pleased with the outcome and are looking to a prosperous future as part of the Elis international family. On behalf of all the team here at Crowe we wish them every success. Read the Irish Times news article.